How Whole House Water Filters Work. A typical Home Water Filter System is located at the Point of Entry into your Home or Small Business - where the main water line enters the building. They are placed before hot water heater to filter cold water before it is heated and gets separated into hot and cold water lines. Cold water is much easier to filter, which is the main reason of this set up. With a whole house water filter , your home will have filtered water in every faucet, including kitchen, refrigerator or ice maker, bathrooms and showers. Drinking water, and showers are especially important because this is where you get in contact with chlorine - a typical disinfectant used by water municipalities - the most. 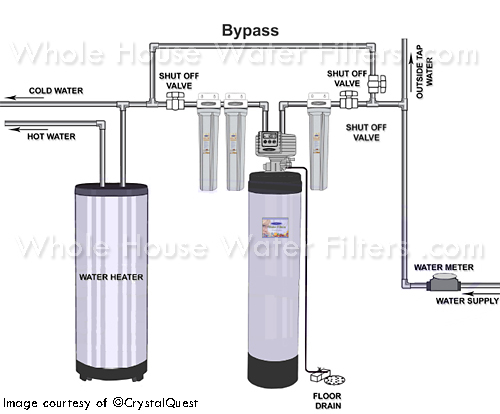 Properly sized Whole House Filter System will filter out chlorine and trap other contaminants, such as sediment and rust, Volatile Organic Compounds, metals and others that can be present in your water source. Typically, it consists of a Sediment pre-filter which traps floating particles larger than certain size (such as 5 micron). After water passes through a pre-filter, it is pre-treated to enter a more advanced filtration stages. Usually, next stages are represented by a single or series of cartridges (in budget systems), or single or multiple large tanks (for advanced systems, water softeners and well water treatment). Optional Bypass can be built by your installer (we recommend a certified plumber) so you can have continuous supply of water in your home while system is being serviced, or filter cartridges are being replaced.